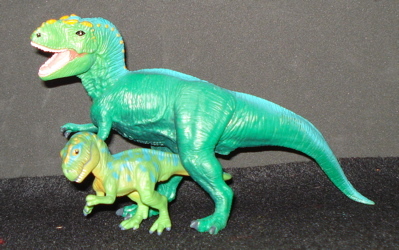 The Safari Tyrannosaurus Rex, why 1996 was a very good year. 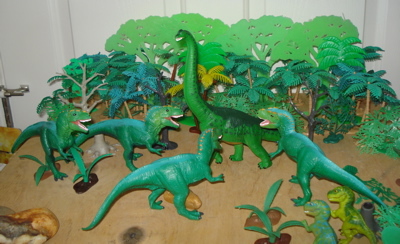 In the Green Corner: The Wild Safari Tyrannosaurus Rex!! of the new sculpture. 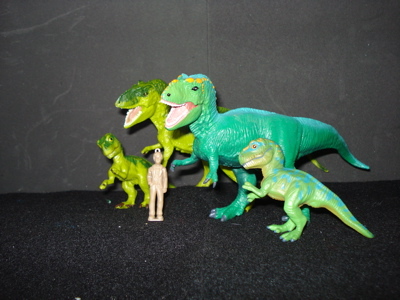 (Baby T-Rex included in family photo) The baby Rex mold has stayed the same. 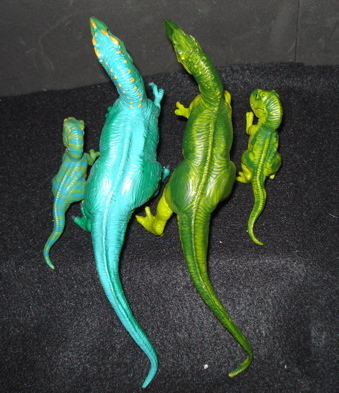 The babies are only two & one-half inches tall (2.5", 6.5 cms) and match the adults coloration. 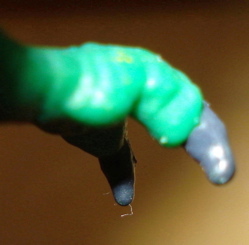 The new figure is a base lighter (yellowish) green with a darker, but more nuanced, green upper body. 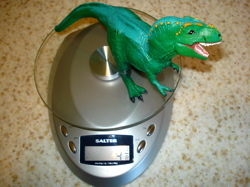 Clearly this is meant to look more like a "real" Tyrannosaurus and less like a toy. 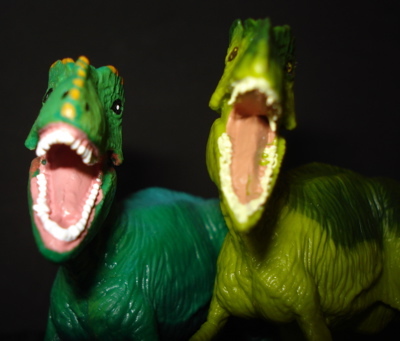 The detail in the heads of both is excellent, the teeth on the newer model are a little bit more sharply detailed than on the original. The eyes, too, have been changed and now have a bifurcated yellow vertical slash as the pupil on the round black eye, rather than the little white dot. It is an actual improvement. 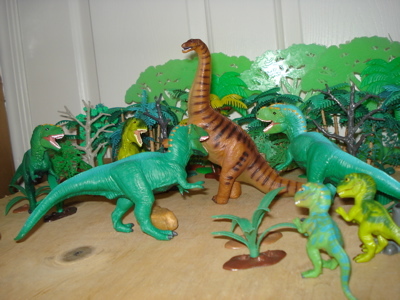 Hunting has never been a problem for the Safari Tyrannosaurus Rex and irregardless of the era, Jurassic or Cretaceous, a pack of these nine and one half inch predators, the ferocious Wild Safari Tyrannosaurus Rex, can show their babies how it's done in the big leagues. This head-on view (right) shows the narrowness of the later version on the right. The strangest thing about this otherwise very nice (though to my mind totally unnecessary makeover) new model is that the sharpness of detail in the "hands" has been lost, the new "claws" are much blunter and stubby looking. Very odd in what is otherwise a much sleeker figure. 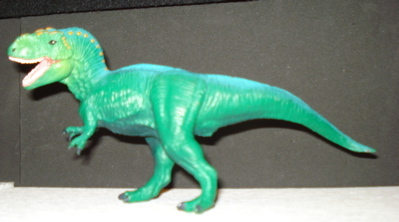 The new model that I have (and I want to thank Safari Ltd. (opens new window) for their generous contribution of this figure) has oddly flattened feet whereas the original model has nicely rounded toes on the bottoms of its feet. Close examination seems to indicate that somebody may have scraped the feet flat but this was received as new so I'll have to find another in a store to verify this last, bottom of the feet, detail. 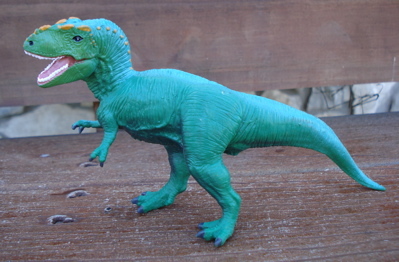 Safari Tyrannosaurus is a dynamic addition to your Dinosaur Collection. 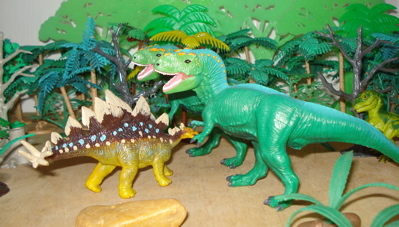 The brightest eyed among our readers may be wondering where the two Tyrannosaurs on the left side of the lead photo on this page come in to play. Safari has constantly improved and upgraded their figures. 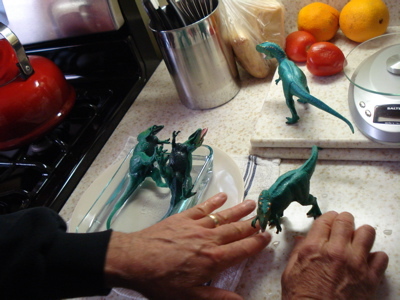 Changing colors, sculptures and quite often both, as molds age and new paleontological evidence for a creatures' posture and appearance come to light. (Admittedly, there is no way evidence of colors will ever be found, okay?) 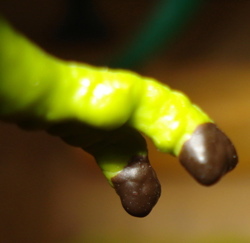 This has resulted in ever increasing detail and more life-like sculpting in their figures. 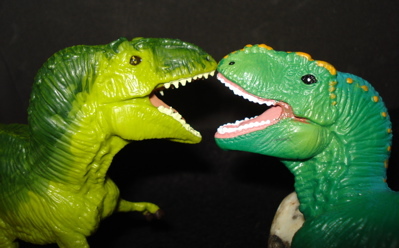 2005 saw the introduction of the Safari Juvenile T-Rex and 2008 saw the all-new Safari Tyrannosaurus. These two will be taken up on a separate page. 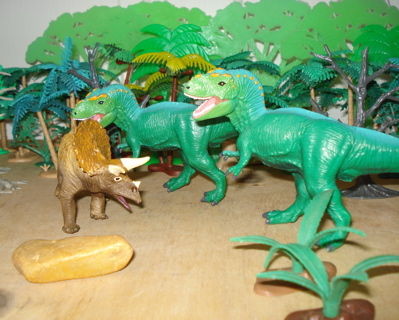 Originally they were to share a page (like the Safari Allosaurs) but I came up with too many photos. So you get more details. 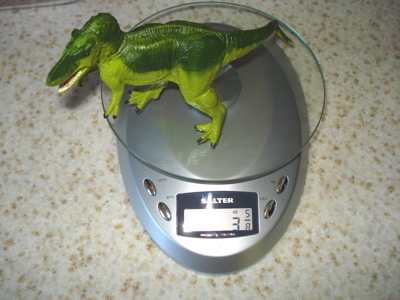 The Safari Tyrannosaurs are pthalate/toxin free and would be safe enough to eat if they were edible at all. Which they are not. They are plastic. They come hand-painted (in China, where it is a hobby) and therefore, despite the fact they are all the same, there are always individual differences too. 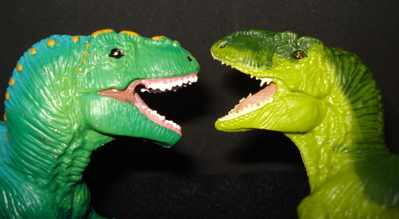 You can repaint them yourself, reposition their limbs and generally treat them as you would want to be able to treat a toy... to no ill effect. These are as rugged as they are good looking. 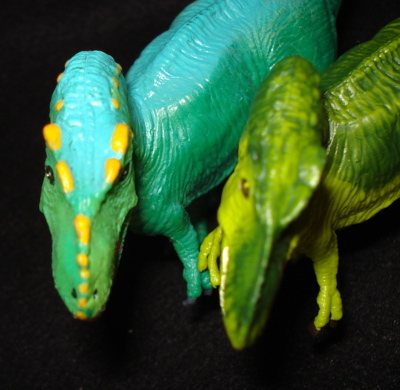 I have had most of mine for more than a decade and their original paint-jobs are still bright, their detail remains crisp and clear. The original 1996 dark green model can still be found in stores (I saw a few on the shelf two weeks ago) although it (may be be out of production and) is being replaced by the newer, thinner, lighter green version. Prices vary online although I haven't seen anybody trying to get more than about $8.00 for them. 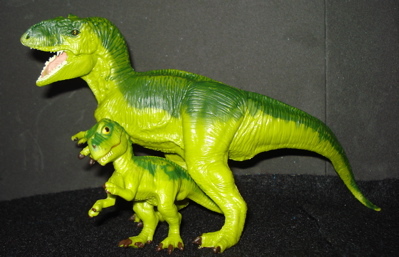 The Tyrannosaurus baby has remained unchanged since its introduction in 1997. Well, that's not entirely true. 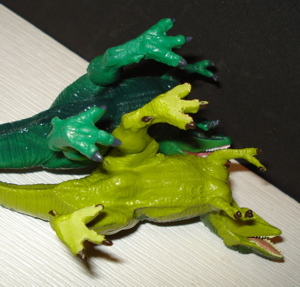 The color has gone from a juvenile version of the dark green to the lighter color green of the new adult. The prices for these hover around $2.00 a piece. Go get 'em. The past and the new wave. 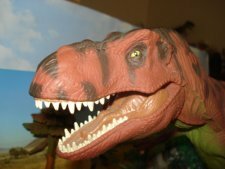 We hope that you enjoyed this Safari Tyrannosaurus Rex page and will take this opportunity to return to the main T-Rex page.